Will you be rocking the hair scarf trend this spring? 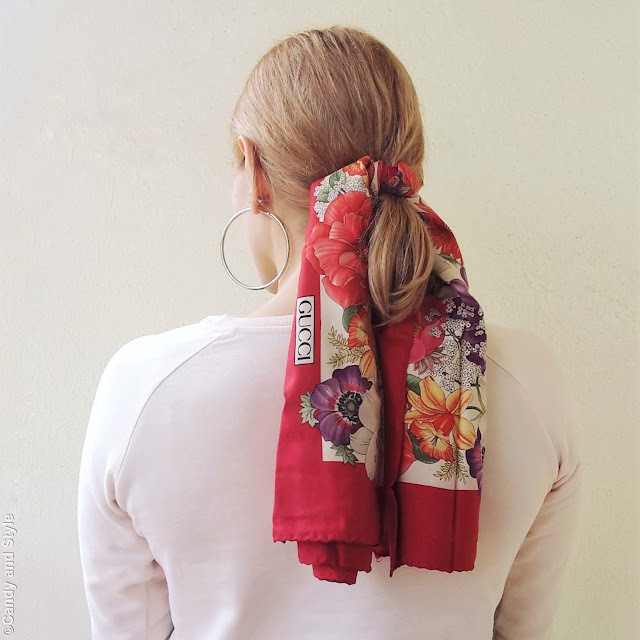 Un'idea molto carina per sfruttare questo bel foulard! such a great idea dear like it,thanks for sharing..
You’re so right Lilli! A scarf is the perfect way to hide a bad hair day and lit looks so stylish as well. You wear your’s beautifully! Un accessorio che a me è sempre piaciuto molto. Io utilizzo anche delle fusciacche che inserisco all'interno delle treccia. I like the way you style your hair with the scarf. Btw. the scarf is also very nice. Looking so chic Lilli with your ponytail and Gucci scarf. This is a wonderful idea. Scarves are my favourite accessories and I do wear them this way sometimes, tied around my ponytail or in some cases around my bun. I love how you wear yours. You have picked out a very pretty scarf.